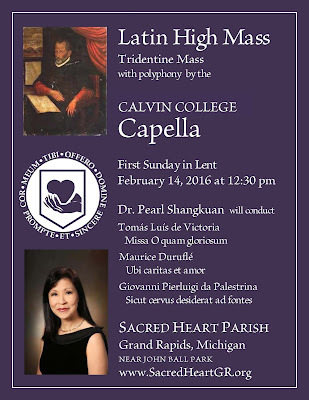 The student Capella of Calvin College, Grand Rapids, will sing polyphonic works of Victoria, Palestrina, and Duruflé at a celebration of the Extraordinary Form of the Roman Rite on the First Sunday of Lent, February 14, starting at 12:30 pm, at Sacred Heart of Jesus Parish in Grand Rapids, Michigan. The college’s select, touring choir, Capella is under the direction of internationally renowned conductor, Dr. Pearl Shangkuan. Sacred Heart Parish offers the Traditional Latin Mass as a Missa Cantata every Sunday and major feast day. A number of school and college choirs are presenting settings of the Mass Ordinary at this Mass as a way to experience the works of great composers of Latin liturgical music in their authentic setting. Father Robert Sirico is the pastor of Sacred Heart; Daniel Bennett Page is the director of Sacred Music.